UPDATED: Prosecutor Kim Foxx said in a statement that the case was dropped because he would only receive community service if convicted, and she says he's already done his service to the community and he has actually forfeited his bond to the city of Chicago. Oh?! ABC News legal expert Dan Abrams says it actually sounds like the prosecution had a hole in their case. 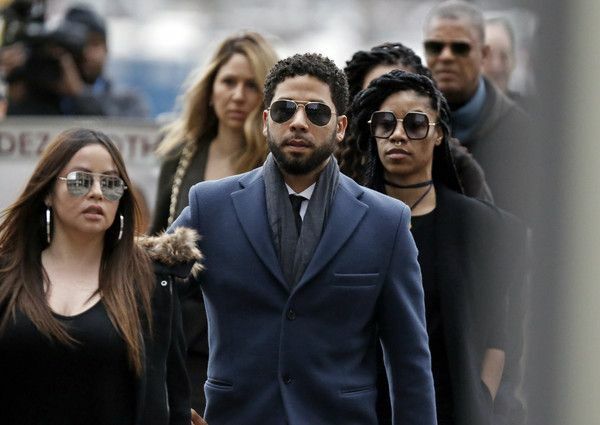 Jussie and his legal team pulled up at the courthouse in Chicago today and left with some good news for the "Empire" star: Prosecuters have dropped all 16 charges against him! Jussie was facing multiple felony charges after being indicted by the Cook County grand jury. He was accused of allegedly falsifying reports about being the victim of a hate crime near his home. Now, his record has been wiped clean. Jussie himself hasn't yet said his piece, but his lawyers are talking. "He was a victim who was vilified and made to appear as a perpetrator as a result of false and inappropriate remarks made to the public causing an inappropriate rush to judgement," his attorneys Tina Glandian and Patricia Brown Holmes said in a just released statement. 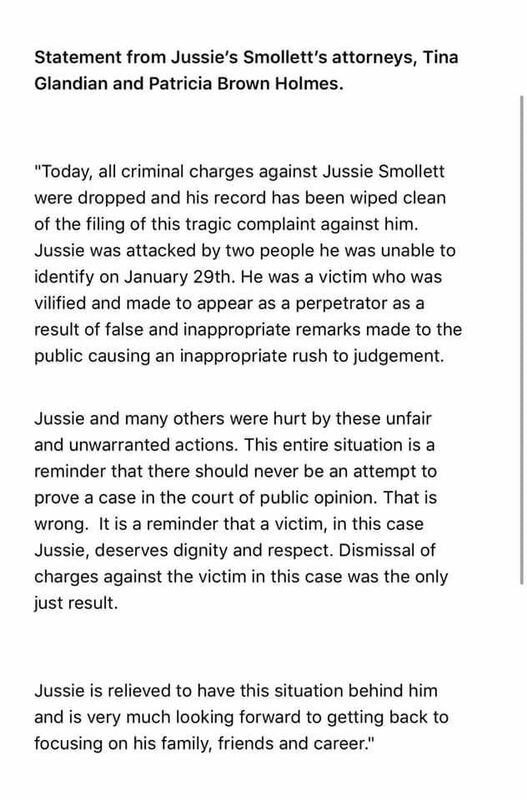 A source close to Jussie says the prosecution's case "disintegrated." As we reported, there were issues with the $3,500 check the 2 brothers received from Jussie. Police Superintendent Eddie Johnson had said the money was payment for the fake attack, but it appears it was actually for physical training. Can't say we saw this news coming. Jussie reportedly will get his $10K bond money returned, and that's that on that. For now. Post a video or audio message to our brand new Yappa widget below! It's like Facetime for comments. Tell us how you feel about Jussie getting cleared of all charges.